I guess this wasn't the end of the world after all. Its not like we're seeing Spiderman hawking Disney movies, right? What's that? Tron tie-in covers for Marvel comics? Hmm. Well, I'm sure it will be done in good taste . 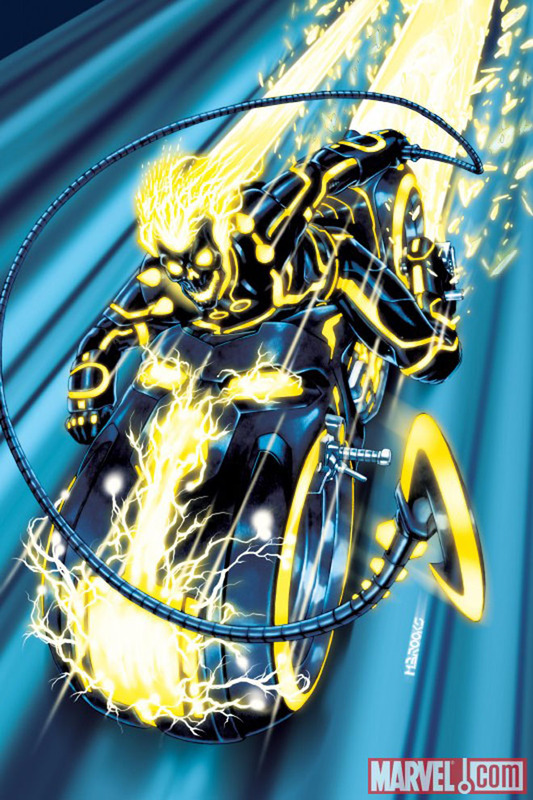 I mean, they're not gonna put Ghost Rider on a lightcycle or anything, right? OH, WAIT - THAT'S MY NEW CLIPSPEAK. APPARENTLY MICROSOFT SAM QUIT. THE PERSON PLAYING Da Toad WILL NOW BE VOICED BY MICROSOFT ANNA. I AGREE! DISNEY MEGA CORPORATION WILL SELL OUT EVERYTHING MARVEL(OUS). THEY'LL SAVE THEIR CHARACTER INTEGRITY FOR THEIR CLASSIC DISNEY BUNCH OF PROVEN (SELLERS) SUPERSTARS.